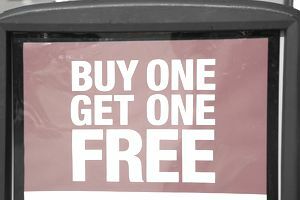 One of the biggest marketing ideas in recent years has been the concept of Buy One Get One. This can come in a variety of offers from buy one get one free to buy one get one 50% off. But no matter the variety, they all do one thing very well—they drive sales. The most important part of writing effective ad copy is to have a compelling offer. And buy one get one, or BOGO for short, is compelling. Like many offers, it is the perception that is most important, not the reality. In fact, the reality is if you do a BOGO 50% off, it is the same as 25% off your entire purchase for the customer, but it feels like so much more. The perception for the customer is that they are getting a big deal. And that is what matters. BOGO is one of the best "perception" offers you can use. But the beauty of this offer is in its benefit to the retailer. If you were to run 50% off everything in the store, you would have a lot of tickets with one item on them. That means your margins for the day would be hit hard. But if you did a BOGO, then your margins still take a hit, but not as dramatically. If you have keystone margins (50%) on items, then every time a customer gets a keystone item with 50% off, you break even. But not everything in your store is at keystone. You have items with even higher margins. So, directing a customer to buy one then get one means that your margins can be less impacted. For example, if they buy a 60% margin item and the free one is 35% margin, you just came out ahead. BOGO is designed to clear out and move inventory. Use it in that way. It is also a way to create cash flow. Use BOGO when you want to generate more cash. People have to buy more to get the offer, so you get more cash. While this is only true if your BOGO is a percentage off the second item, it does work. And since BOGO is a common offer for customers now, the psychology of the deal is often times the same, meaning BOGO free and BOGO 50% off still make a customer feel like they are getting a great deal.